The next step in remodeling the family room was to put molding in the coffered ceiling. A traditionally beamed ceiling would have looked fantastic in our formal living room where ceilings are 10 foot high and there is plenty of light. Not so great in this darker room, where a coffered ceiling makes the ceiling feel lower. Let’s face it, neither of us wanted to go the expense either that boxed beams would require. 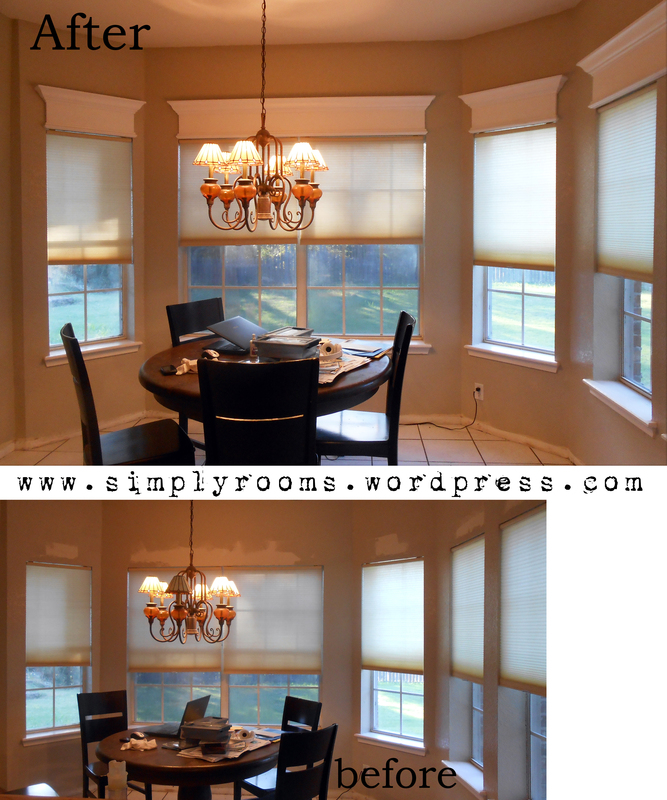 Even doing a faux look (like at this blog) would have taken more time and money than we wanted to do. However, this room lacks definition and with it’s huge coffered ceiling we knew some sort of molding would take it to the next level. The molding we decided upon makes the eye go upward and defines the ceiling but doesn’t lower the ceiling visually. I guess you can call this the poor man’s beamed ceiling look. 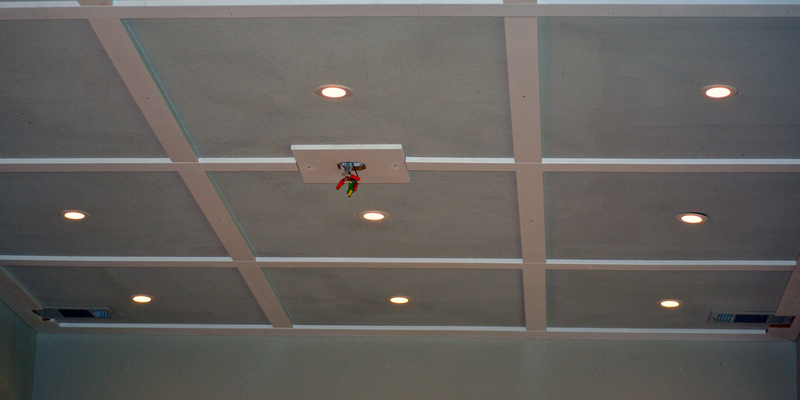 Before we begin, we installed recessed ceiling lights, and marked off all the lines for molding with chalklines. The ceiling should was painted the final color before we started this project. Be aware that white molding looks best against a darker wall color. Here we are using Valspar’s allen + roth Rock ar720 from Lowes; this color is being used throughout the downstairs to make the space look larger (vs. using different colors in each room). To prep for your project, measure your room and mark on paper where you want your molding to go: even and equally spaced squares work best. Our ceiling dimensions: 135″ x 201″. You can tell from our rough graph that the squares aren’t perfectly even in their dimensions but the difference is minimal and not noticeable from below. Black lines mark 1×4 placement and red indicates the 1×6 boards. Mark out with a chalk line which will be erased or covered by projects end. 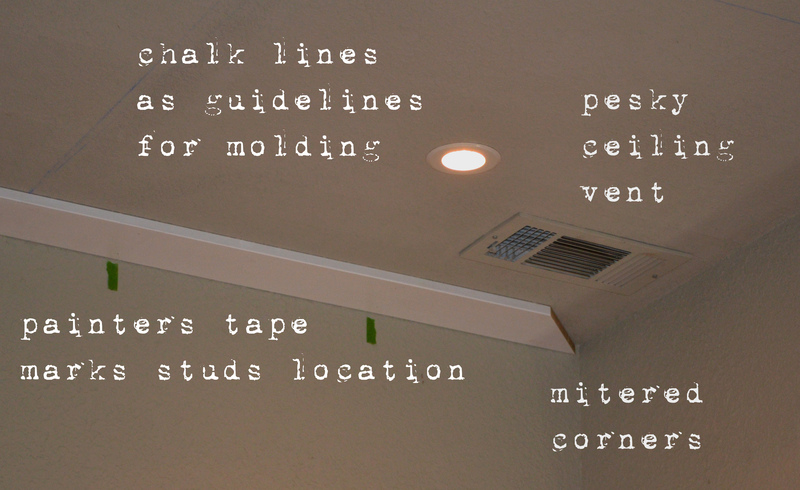 Take a stud finder and be sure to locate where you can attached to studs in your ceiling. No studs for nailing up boards? We worked around that and will show you how too. Materials for this project: a saw (we used power miter saw and circular saw), a nail gun and compressor is a must, chalk line, liquid nails (our project took two tubes), finishing nails, toggle bolts to mount in areas without a stud to mount boards (plan a bolt for every 4 feet approx. ), paint for your molding, foam paint roller with tray, fine sandpaper block and wood putty. Drop cloths may also be needed; our floor had been removed in anticipation of replacing it. Lumber for your project: we used white primed MDF boards (1×4 for inside squares and 1×6 for the outer border), in this blog post. Depending on what you want your own project to look like you can finish it off differently – this is just an example of what we did. For example, the look in this post with no additional trim or crown gives an appearance similar to Board and Batten. However, our next post will show additional trim we used for a second layer. For this project we started with primed white, MDF boards, because MDF is cheaper and the look of real wood doesn’t matter since we are painting. Because it was primed white, and I’m painting it white, painting went faster. If staining, go with real wood. Boards were painted twice more to get even coverage and sanded lightly between the first and second coat because sometimes MDF (or any wood) has slight blemishes. If you paint before being mounted it saves a lot of hassle and just means final touch ups. Before mounting the board up, make sure it is cut on both ends of the board to fit the space. You will want a tight fit – no gaps! This may take adjustment especially if you find that your walls and ceiling are not straight, which is typical of older homes or homes who have settled. 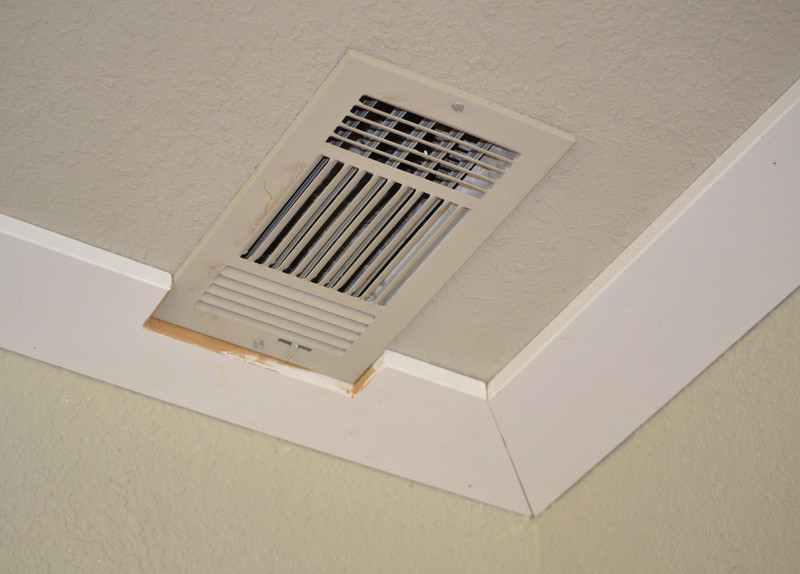 Speaking of which – ceiling molding will not look good up on an uneven, damaged, warped, wavy or crooked ceiling. Go with plaster and paint to repair these types of ceilings/walls. You may also have to work around fixtures. We had to cut around this ceiling vent which could not be moved. Also, shown is the corners where we went with mitered edges; other boards (see below) butted end to side. We also had to put in board for the ceiling fan, allowing an area for electrical and hanging of the fan. 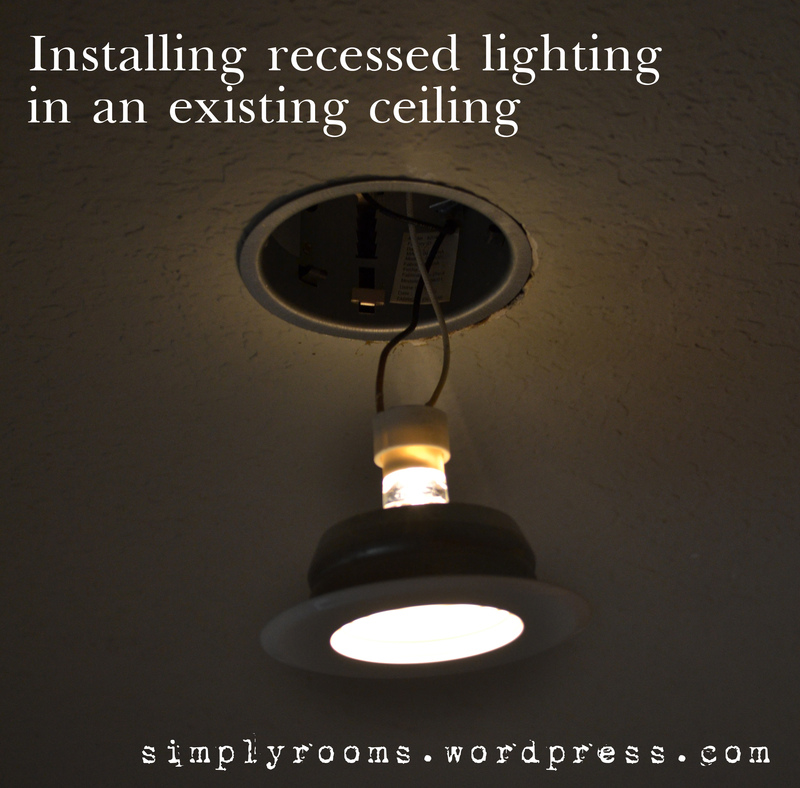 Mounting to ceiling areas with studs: This is the easy part. Using your stud finder, mark the location of studs with painters tape. This helps as a guide for using your nail gun. Cut your board to fit, run a line of liquid nails on the back of the board, mount and nail into place. Be aware that liquid nails won’t be strong enough to hold a board in place on their own – nails or bolts are also needed. You will need a helper on another ladder or step stool, while you finish nailing or screwing in the fasteners. This really is a two person job, not only for holding the other end of the board but to also let you know that the boards are visually lining up. 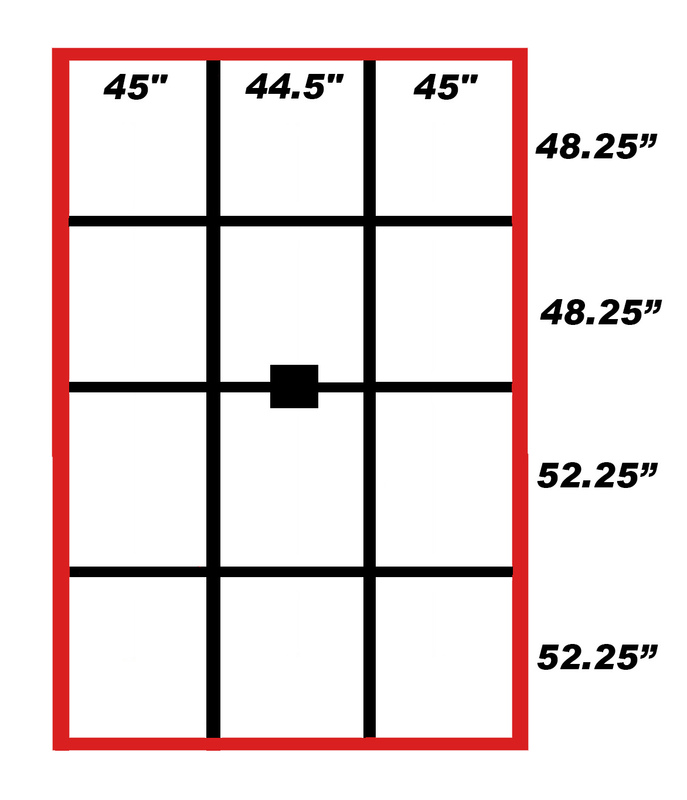 Mounting to areas without studs: Using our stud finder we found some areas would not have studs where boards would be mounted. This required the use of toggle bolts. On a long board we chose two areas to drill spaced out holes (ours was 1/8″) with a countersink hole of about 3/8″. 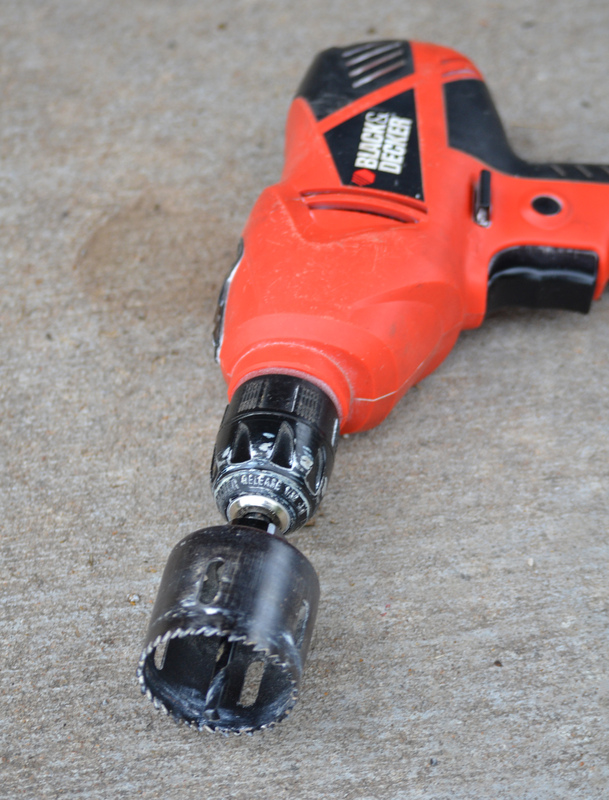 Counter sinking a screw or bolt can be done with a power tool and a specialty drill bit. Another way is drill a shallow hole with the large bit (3/8 inch), then switch to the small bit (1/8″) and finish drilling through the board. The large bit leaves a V-shaped depression in the hole, so it is easy to line up the small bit to finish off the hole. 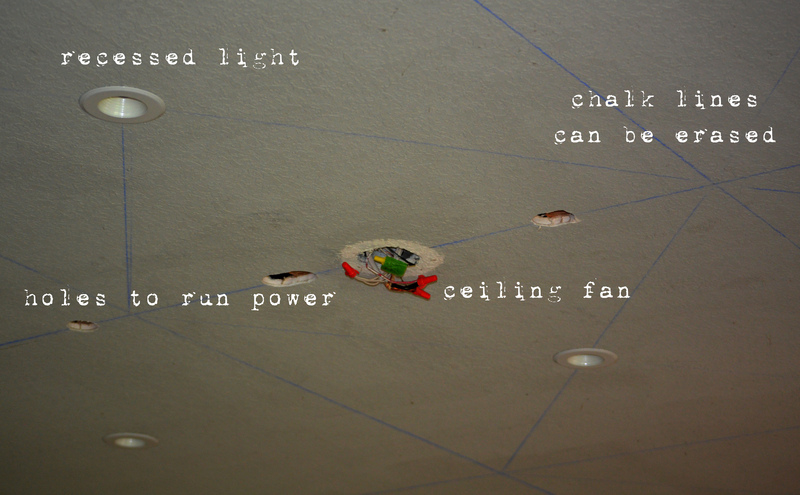 Hold up to the ceiling and mark the ceiling with a pencil or scratch it with a screw tip. 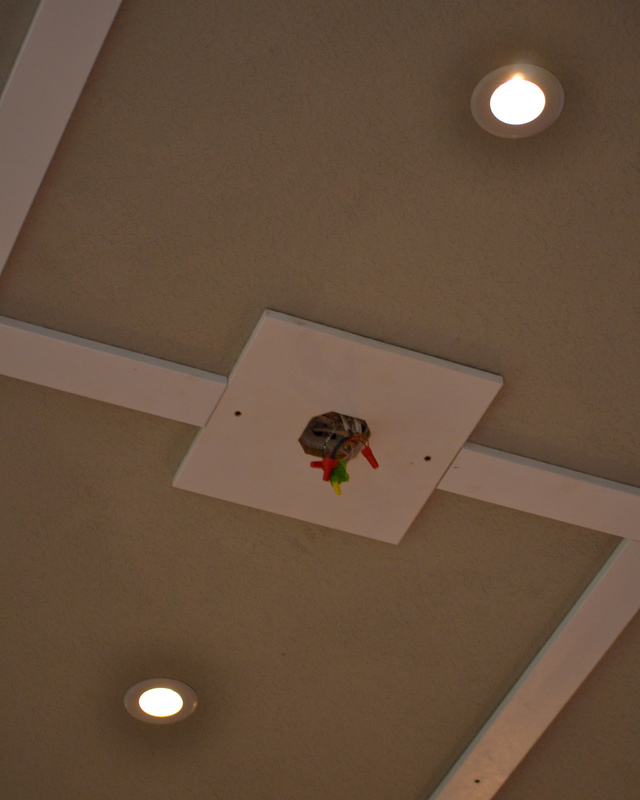 Take down the board and drill a larger hole in the ceiling (about 1/2 inch) at your marked areas; the larger hole allows the toggle bolt wings to collapse and push through. On the inside of the ceiling the wings open giving your board support. Insert the screw in your board, apply liquid nails in a wavy pattern down the board, and mount. We used our power drill to screw down the bolt. 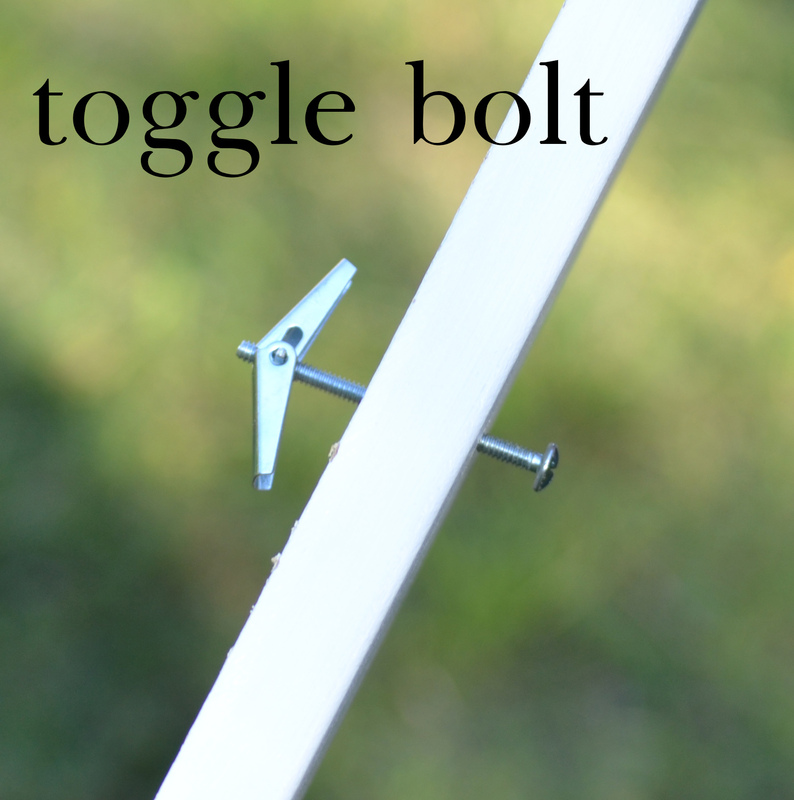 Shorter sections and smaller boards (the 1×4) did fine with only one toggle bolt; our longer sections required two toggle bolts. Use wood putty to cover holes, lightly sand after it is dry, and touch up with additional paint. At this stage we are finished with the first layer of molding. You can stop here if you wish for a simple board and batten look which would work well with an updated country, farmhouse or home with transitional décor. Because there is a lower entrance to get into this room and I don’t have a wide angle lens these were the best photos of the ceiling I can could take today. The project looks a lot nicer in person! We will be installing additional molding so look for a new post after the next weekend with the details on trimming out your boards with additional molding for a layered and more detailed look. We have a large family room which is one of those awkward and bland rooms that is a decorating problem child. One of it’s major problems is that it’s often too dark and needs even illumination, so the first major project for this room, working from the ceiling down, is installing recessed ceiling lights. 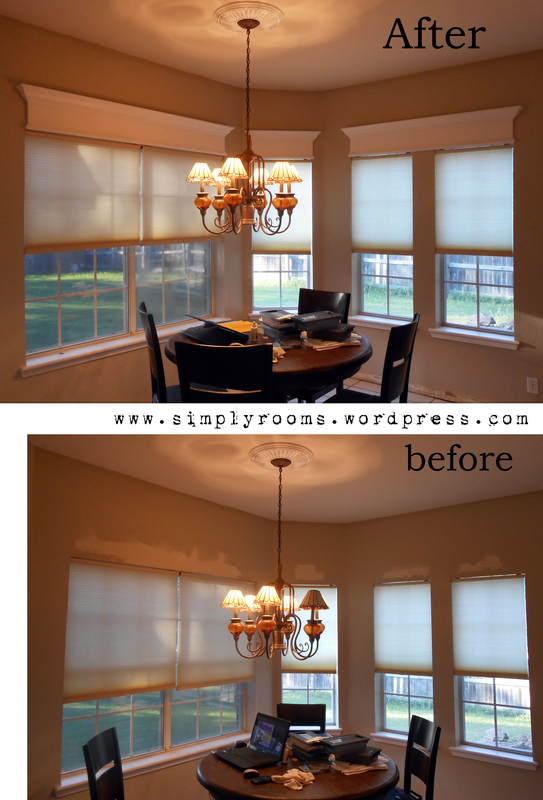 Before you begin it’s easier to paint the ceiling vs. doing it after installing the lights and future molding. Since the project will have white ceiling molding we went with matching ceiling and wall paint (Valspar’s allen + roth Rock ar720 from Lowes). This color is being used throughout the downstairs to make the space look larger (vs. using different colors in each room). TIP: if using molding, the more contrast between wall and molding colors the better your end project will look. 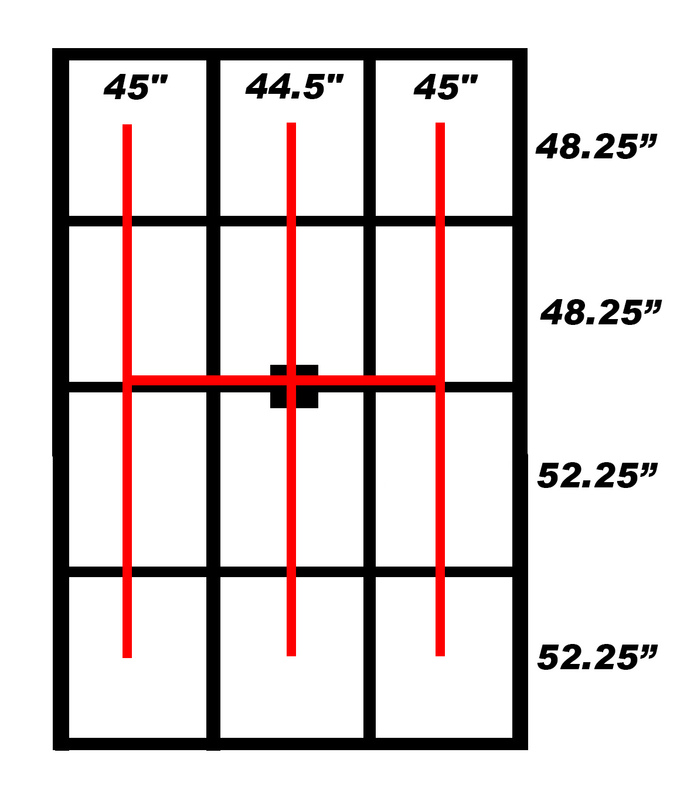 Before you begin this type of project, grid it on paper and than check stud locations as well as electrical. We planned on pulling the power for the lights from the ceiling fan which would mean the future replacement fan would have no light. This made it a pretty easy project, electrically speaking. On our plan here black lines is where molding will be placed; red lines show how the electricity was run. In our room, it turns out the ceiling fan was not centrally located, thus measurements had to be adjusted. Depending on the age of your house you may find some surprises like this too. When choosing your lights, consider: how much room is in your ceiling; the amount of light you want; the type of light; how big a diameter the exposed light ring you want; how tall the can unit for the interior ceiling space; and if it will be on a dimmer (some lights don’t dim). We needed a low profile canister light so it could fit in within the existing ceiling structure which had no attic access. The light we chose came from Lowes. We had a central ceiling fan that had power for a light and a fan. The first thing we did was remove the old fan and from the electric for the fan light, and ran a line of electricity through the ceiling in a grid pattern. The holes we made to run the electrical line will be covered with future molding. The 12 box grid we marked out with a line of blue chalk line. 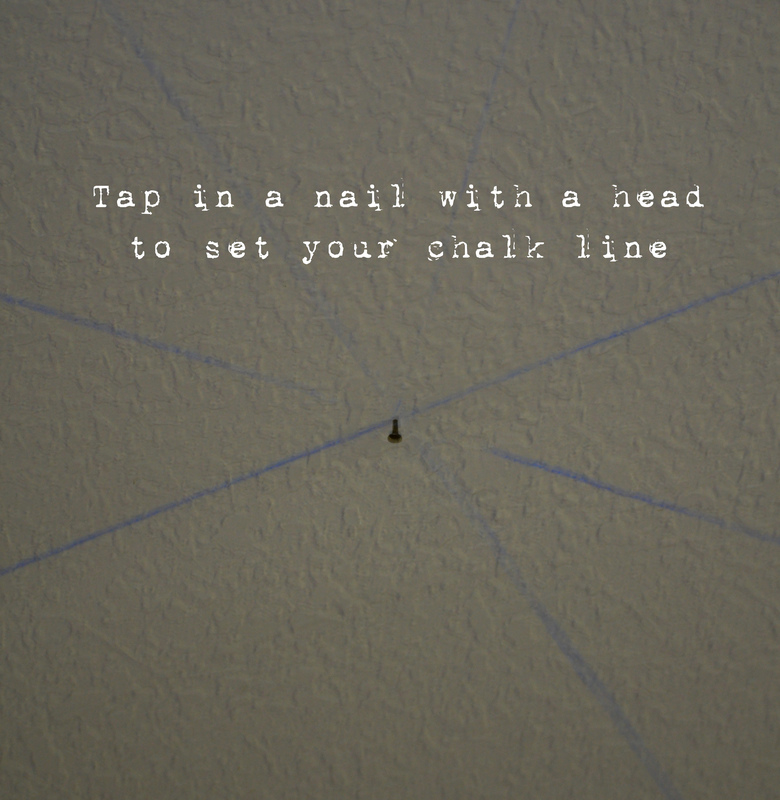 You can tap in a headed nail on one end and run the line from it to the other side to easily snap the line. When the project is done, a brush wipes off the chalk line. 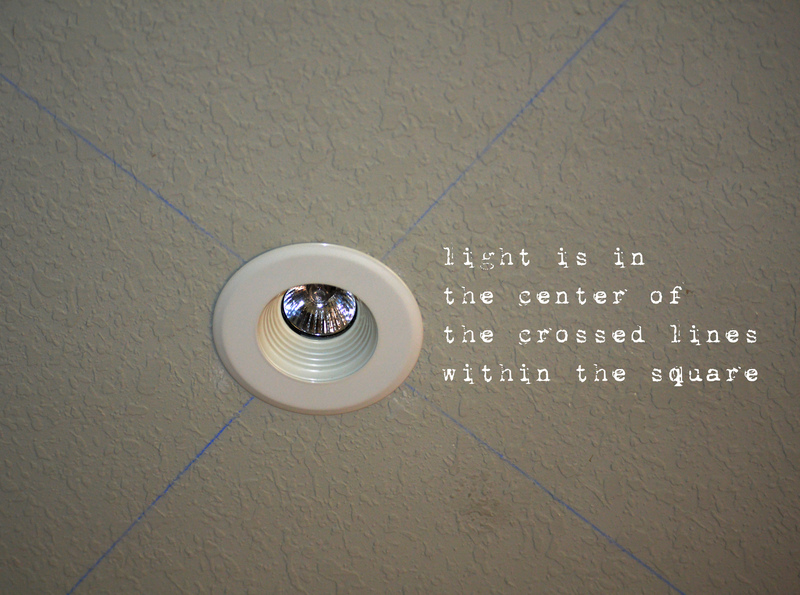 Each of the smaller squares will have a centered light. Make two diagonal chalk lines from corner to corner to make an X in each box. The center cross X will be the location of the recessed can unit. You can use a “hole saw bit” that attaches to your power drill to cut out a circle pattern in drywall. This punches out the circle smooth and easy where you can insert your can light. It also helps as access to run your electric without making too many unnecessary holes. Most of the electrical wire was easily tucked between structural interior beams (behind the drywall) and the fiberglass battings. 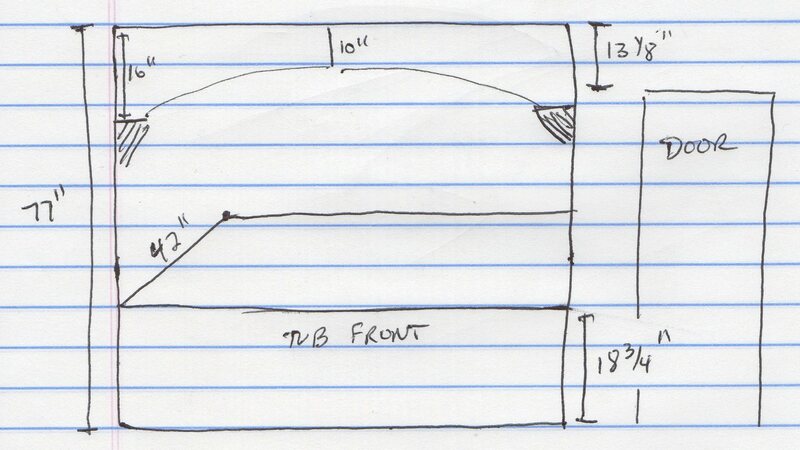 However, we did do a half inch notch in four beams at four different locations. If you do that be extremely careful that you do not impact the structural integrity of the beams. If in doubt, ask an expert before proceeding! Be sure to cut the power from the main box before you wire to the live line. Our 12 recessed lights used Halogen light bulbs and wired to a wall mounted, dimmer switch that we used to replace the old on-off switch for the fan light. When selecting a switch make sure it is rated for the amount of power you plan on hooking it too. This project takes a moderate level of knowledge about wiring and electricity. 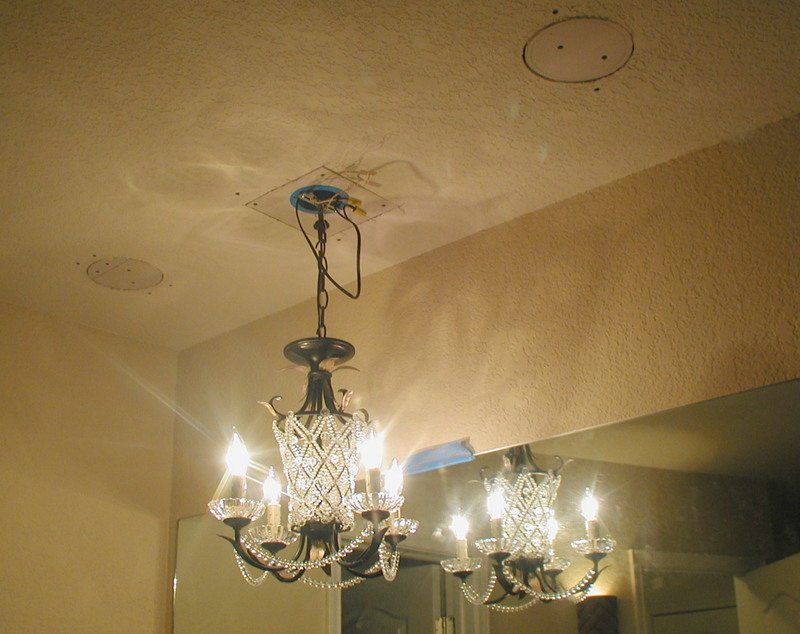 However, if you know enough to wire a ceiling fan you probably know enough to do this project. 🙂 I will be doing better photos of the entire room once the project is complete. 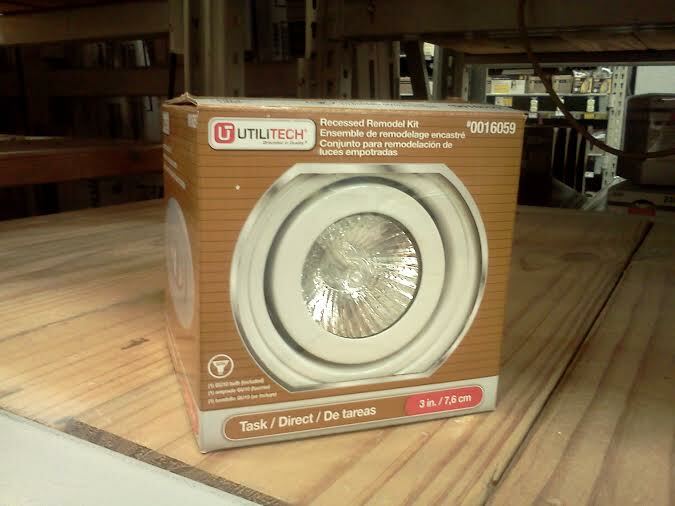 The smaller fixture units are more classy/trendy than the old and larger can lights. Best of all, being on a dimmer we have control – make it bright for visitors or dim for the big movie night. Originally, we had built cornice boards that had a shelf that ran connected over the top of all the windows in the breakfast nook area. I actually really liked these upholstered cornice boards however, at the time we were thinking of putting the house on the market and wanted this area simplified. To make it match the rest of the kitchen, we went with a wood, on the wall, cornice of crown molding. I’ve already gone into quite a bit of detail of how to make one over on this blog post, so here I’ll just show some before and after photos. We still need to put in some molding under the window sill, finish the base moulding and replace the chandelier but this is a big step forward! Yeah! 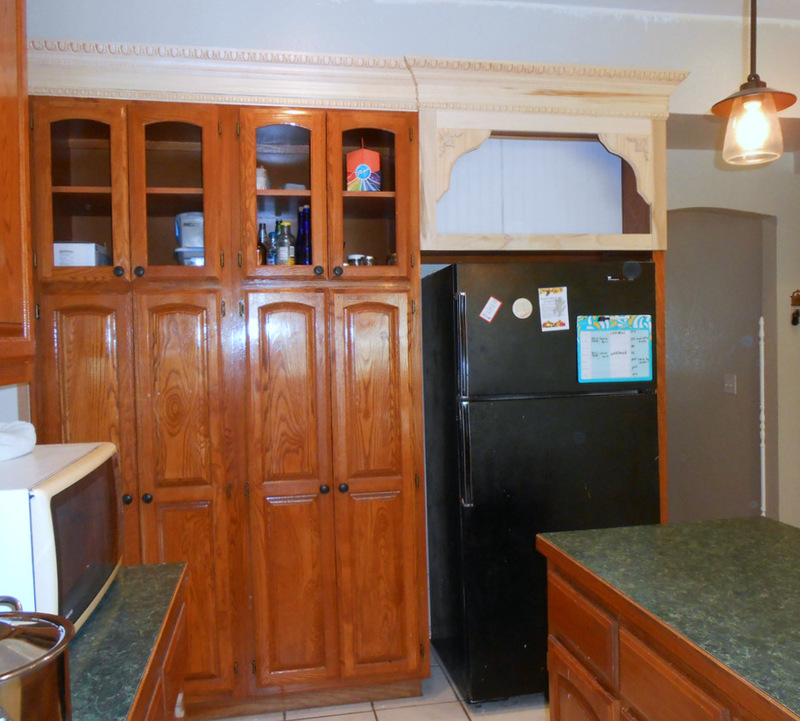 Previously, the kitchen seemed to be a huge solid mass of cabinet doors. After looking at many kitchens, especially ones in houses about $20,000 over our selling range, I decided to change the cabinets to a combination of glass front doors, open shelf cubbies and closed cabinet doors and drawers. The original plan to break up this wall of cabinets was to make the cabinet over the fridge and the stove open, and to make the upper cabinets left of the fridge, with glass inserts. Matching molding would unite the two walls. To keep the kitchen usable, we are going in stages: the upper cabinets on the stove wall is finished except for painting, so now it’s the fridge wall’s turn to be transformed. If you don’t provide enough framing, the beadboard will warp and won’t sit as nicely. Here the beadboard backing had to be cut in half to fit into the narrow space. 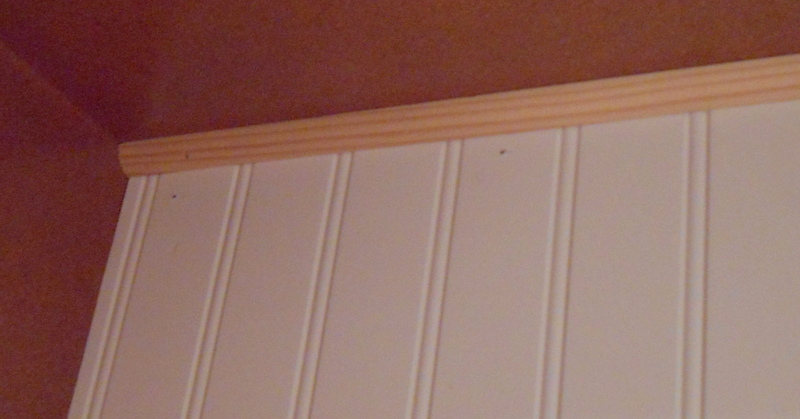 A piece of molding trims out the edge of the beadboard so the rough edge won’t be visible. These touches make the finished project look professional so don’t skip them! The new cabinet facing was applied. 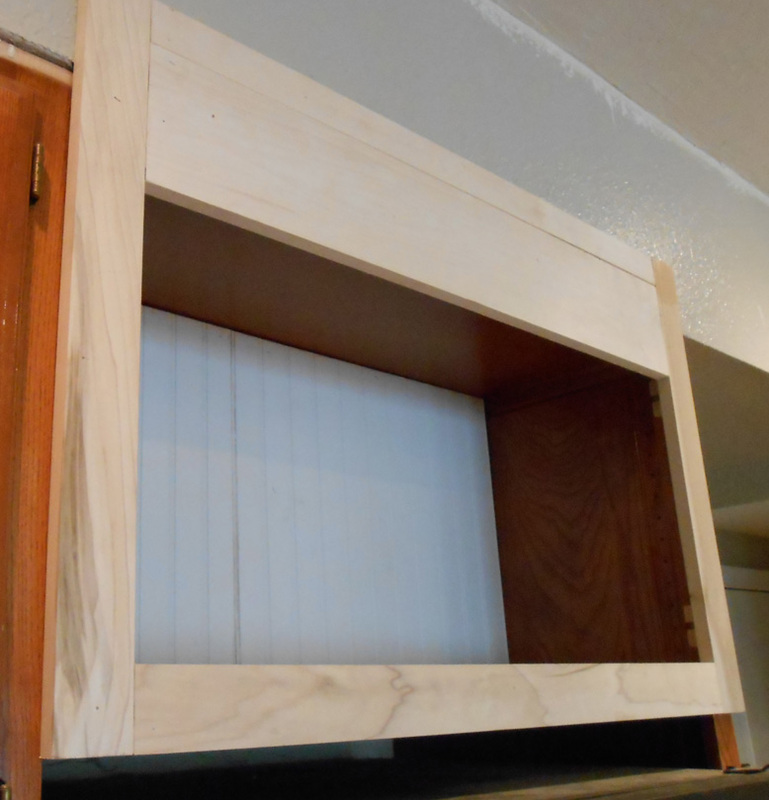 Like the cabinet over the stove, this cabinet will project slightly in order to cover the original cuts made for the hinges of the original cabinet doors. 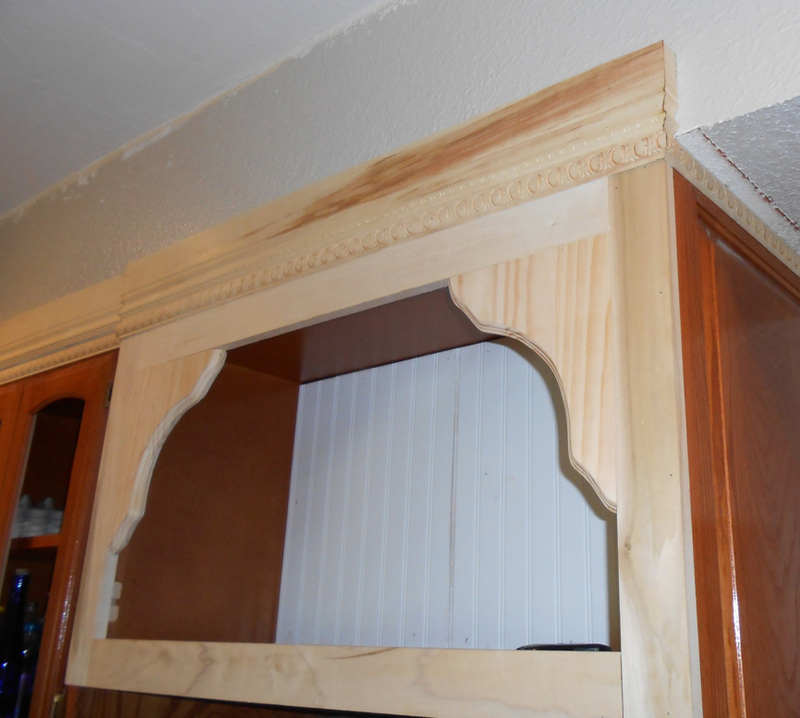 Visually, we change the dimesions with facing to make it look less like a cabinet. (BTW we had to remove the facing to put in the beadboard so do the interior back FIRST, before putting on the facing of the cabinet). Board sizes (and shelf depth) were chosen to match the perspective of the open cabinet now over the stove – always consider matching ratios to current cabinetry in order for a matched, finished look. Doing this lessens the appearance of new additions and makes the entire project look like it was done at one time. Because the facing overlaps the existing facing, the cut out hinge holes are no longer seen from the front and are hard to see from the side. 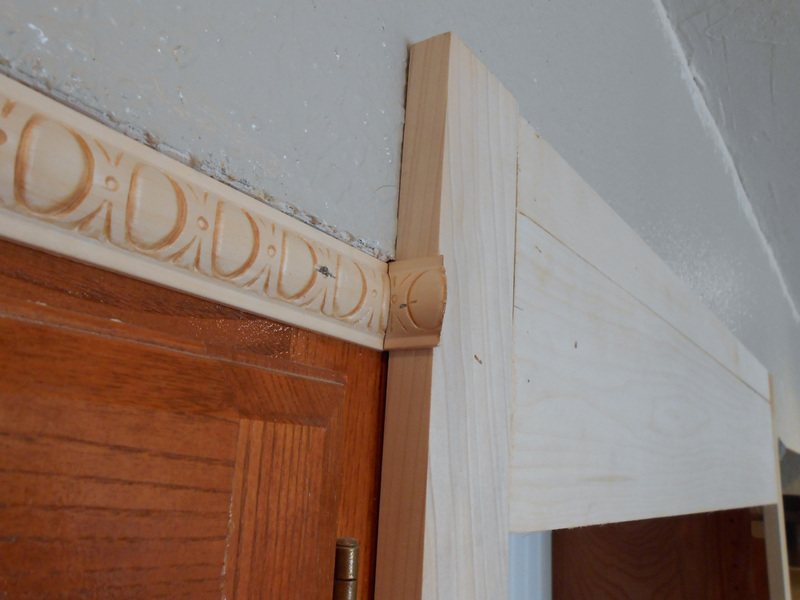 Egg and Dart trim molding that was used on the stove wall of upper cabinets is repeated here. It’s wrapped around the corner of the fridge cabinet wall because the crown will not fit due to the existing sofit (sofit contains central air ducting). The Egg and Dart pattern repeats in the crown molding we will be installing: repeating themes in molding also gives cohesion. Brackets in the same design, slightly larger then the open cabinet over the stove, are installed. 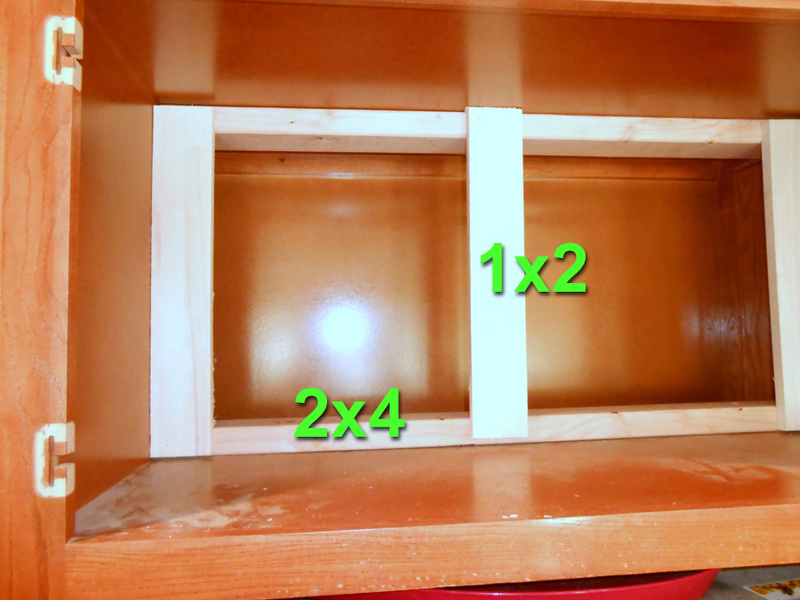 To provide additional nailing support, a small piece of 1×1 is nailed onto the inside of the cabinet. 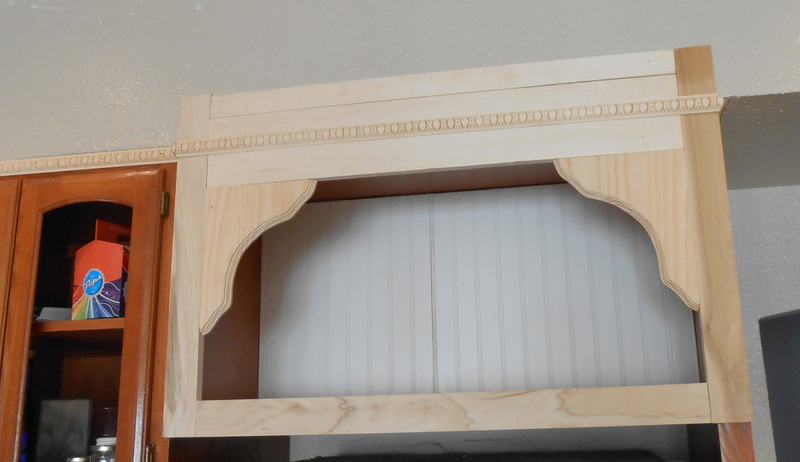 This will be hidden by the bracket, and covers the top hinge hole cut for the old cabinet doors. Across the top, we are doing a combination of base and crown molding just like the stove wall of cabinets. We saw this done at the Parade of Homes in houses slightly above our selling price bracket. For someone who can do it themselves it provides a lot of bang for little buck. 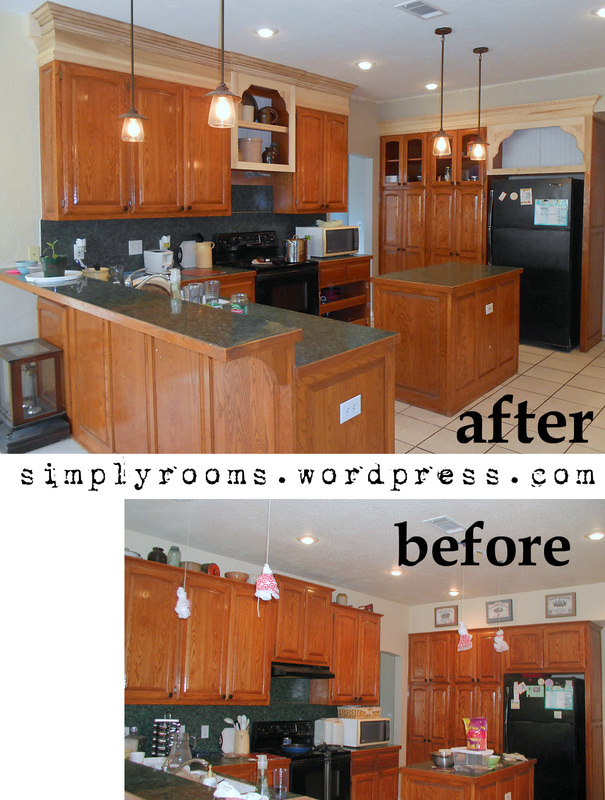 It will give an upgraded look to your tired cabinetry! 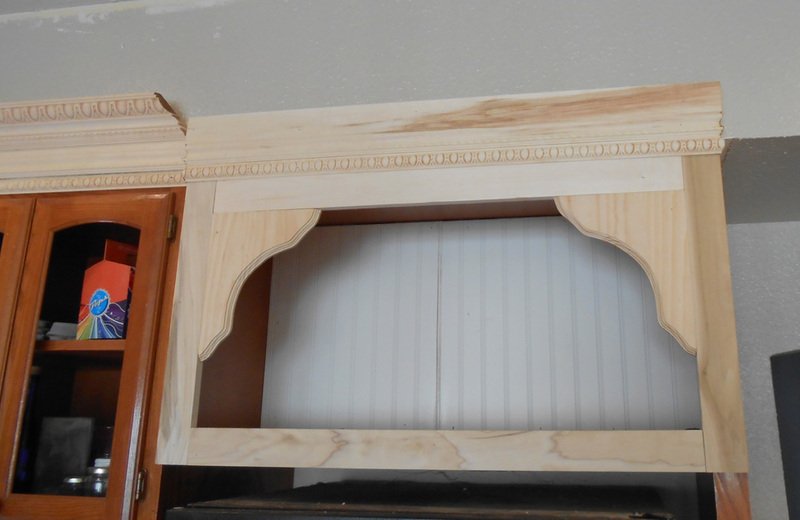 First the base molding is installed and is cut to work around the new cabinet facing. 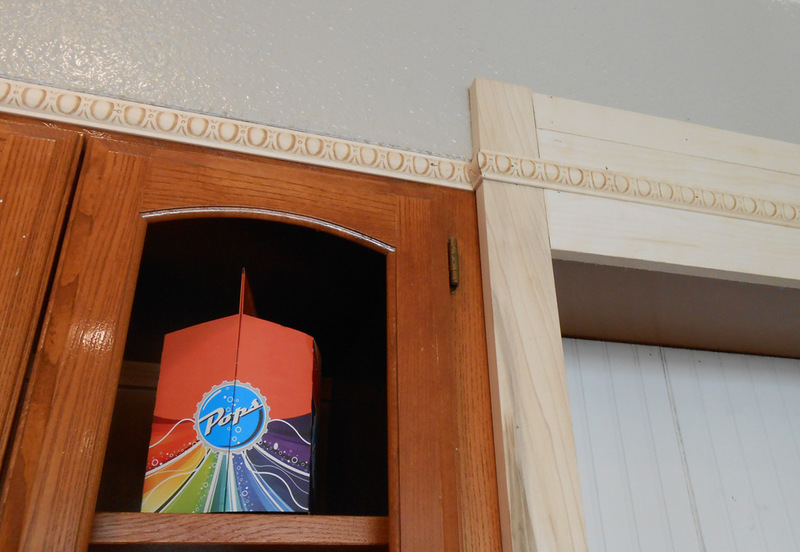 Between the egg and dart trim and base trim, the seam of the wall has now been concealed. 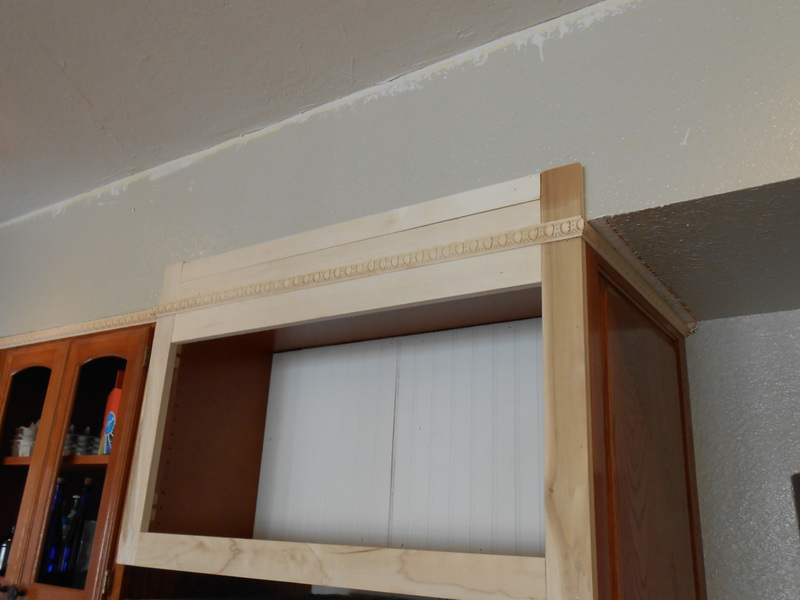 The base molding is installed upside down to show off the decorative trim and leave a flat area for the future attachment of the crown molding. 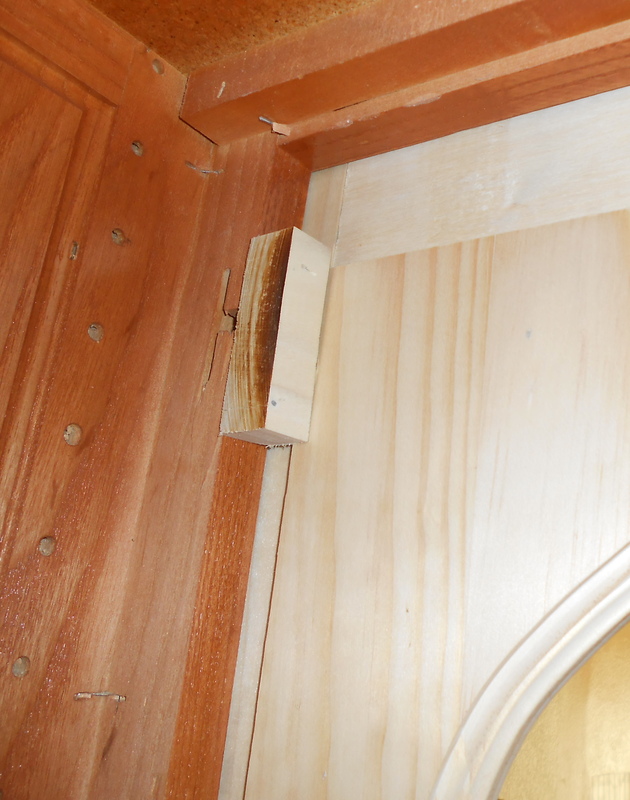 Once all the trim is added, some wooden medallions are applied to the brackets. Wood glue is applied to the backs and they are nailed into place using small nails called brads. The most important thing when applying wood appliques are to make sure they are sraight and centered exactly where you want them. 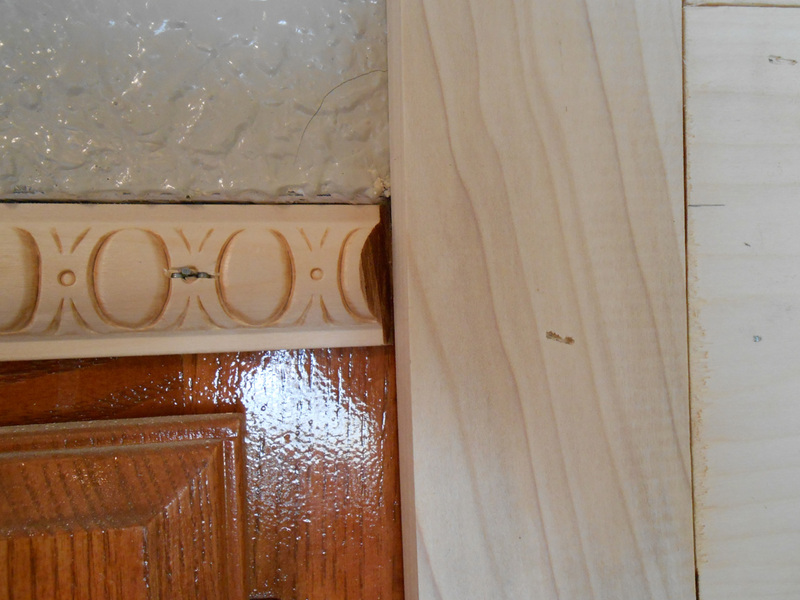 More information on using wood appliques and how to apply them to dress up cabinetry can be found on this former post about our bathroom vanity remodel. Little touches like this can make your end project more personal. 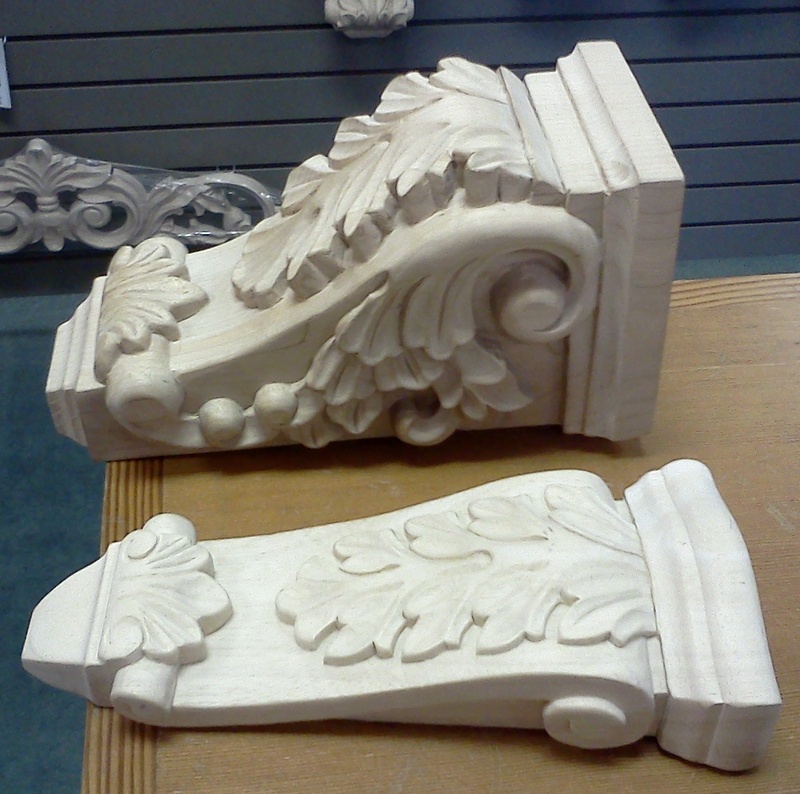 Molding and appliques canprovide interesting detail if you plan on glazing, waxing or distressing in your finishing process. Next up, we returned to the open cabinet over the stove and put in the beadboard backing around an electrical outlet. This beadboard backing was going right against the wall so no false wall was needed. 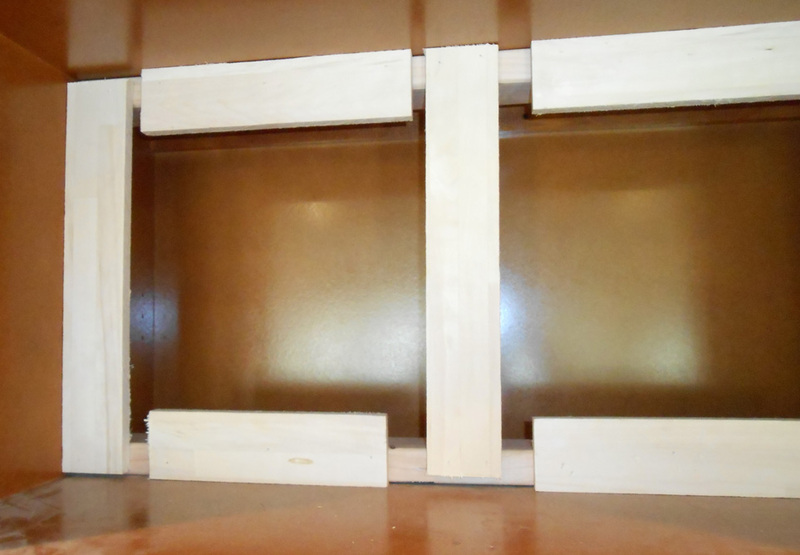 The shelf front is trimmed with complimentary molding. 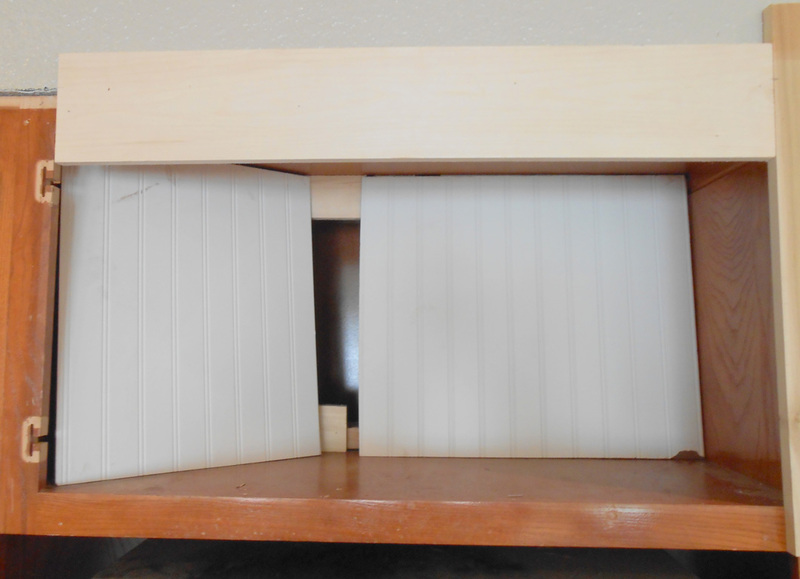 The back of the shelf was trimmed off with a table saw to reduce the depth as the molding on the front adds depth and we wanted the shelf to fit it’s current opening. 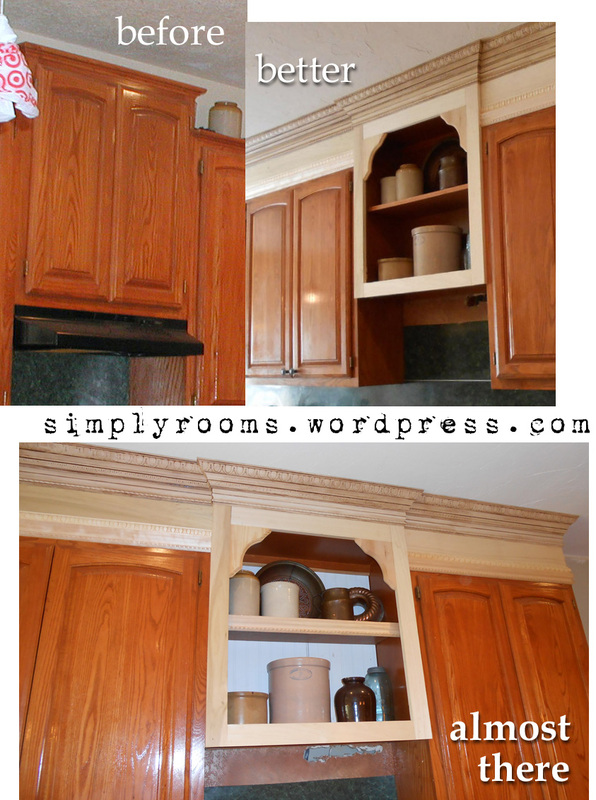 Again when it comes to projects, like these if you know how to work with molding you can trim out something that is average and make it truly special. With some clever pre-planning you can adapt existing cabinetry in good condition to something new. Some various photos, mid-stage. Once the paint goes on the project will really pull together! 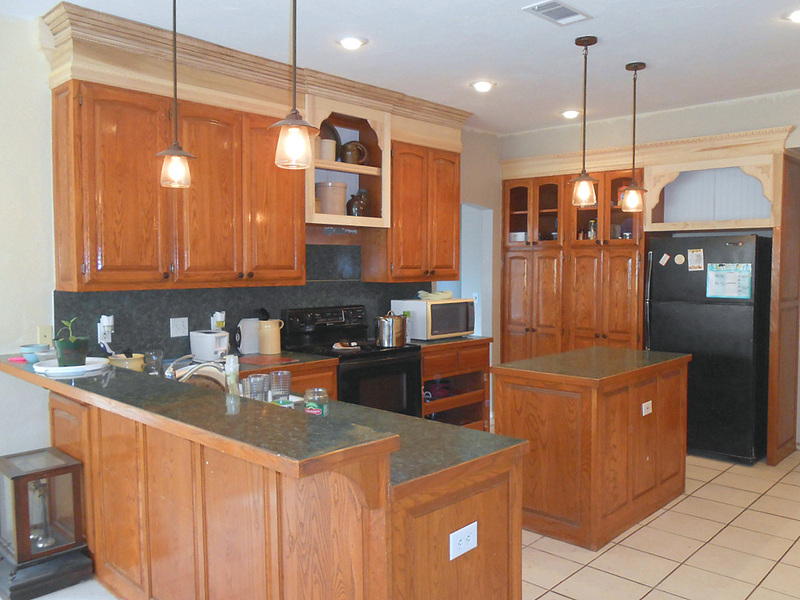 We’ve got another kitchen cabinetry project coming but that won’t happen til August – we will converting the useless breakfast bar to an open shelving unit. 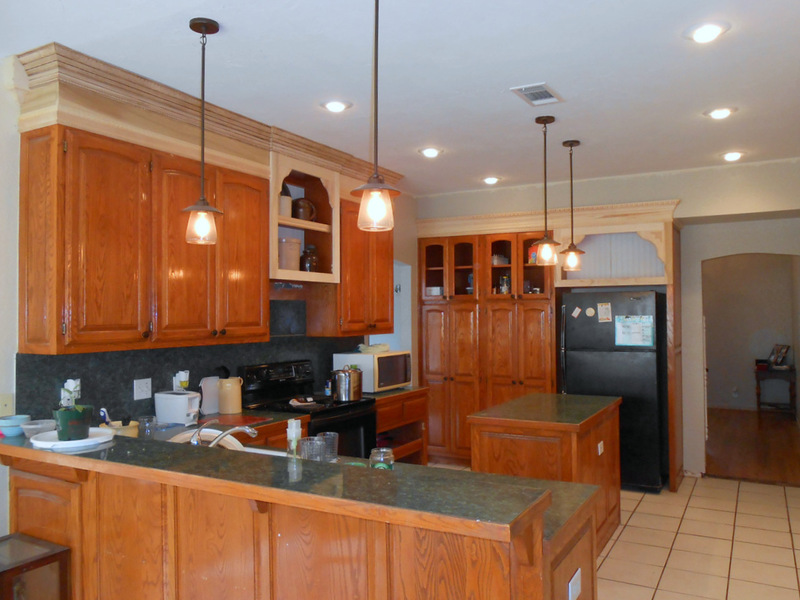 There’s still much to do in the kitchen after that – a revamp of the island, a wooden block island counter, granite counter over the rest, and a stone backsplash. Meanwhile, we’ll be doing some paint sample doors as the paint I was going to use is no longer available in my area. We continue to replace all the upstairs door hardware with the new oil rubbed, brass doorknobs that I found at Restore (Habitat for Humanity) for such great prices. Upstairs alone that’s a total of 16 doors! Each door has gotten an update of white enamel paint as well as the door frames. While time consuming, it’s so much easier to paint them when off the door frame. BTW I’ve painted trim with latex and will never do so again. It looks okay until you try to clean it, then it starts to rub and peel off. Go with enamel for doors and trim. Also, go with one color (hated Trading Spaces and Clean House when they paint the trim some off color like dark purple!). One color makes the room and overall floor plan look bigger. It also cuts down on needing additional cans of paint in multi-colors (no half quarts left). This time around all the doors and trim are getting Lowes, Valspar Ultra Premium High Gloss, White Enamel. This is not a tinted color so is $29 a gallon. I picked it because the bright white practically pokes your eyeballs out! I’m tired of these off-white colors which look dirty 20 minutes after you apply it. I would personally plan on repainting trim about every three years in a house with children and pets; about every five with adults only. For hall walls, plan on the same if not more often. It’s why we put these corner wall protectors up -the corners get bashed up by kids and moving furniture. I’m also touching up the trim around the doorways as some of the wall paint got onto them. It will make them look crisp and really sharp! Professional painters can do this with a sash brush and no tape. I’m not so good so mark out with painters tape and use a 1″ brush for where the moulding meets wall. 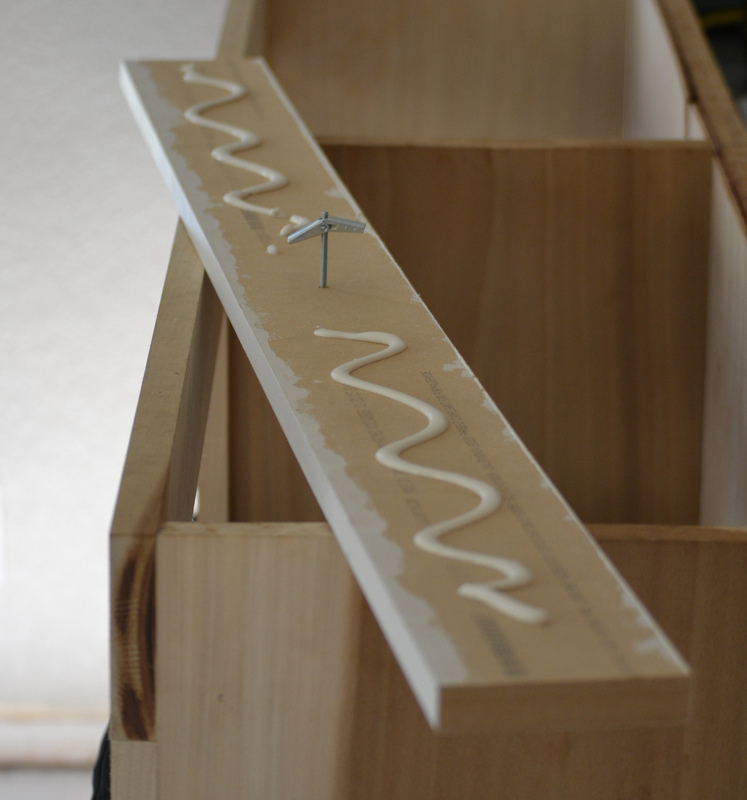 For trim moulding around the door I use a 4″ foam cabinet door roller, and a foam brush to get the moulding’s edge. I’ve also found a few spots where paint didn’t get onto the wall as well as it should. This always seems to be a problem because our walls are not smooth but textured with knockdown plaster. As the daylight changes throughout the day, I sometimes find a different spot so, as I find it, I have marked it with painters tape so I can go back and touch up. This week the ceiling fixtures in closets and halls (7 in total) will be removed and the light rings spraypainted an oil rubbed bronze color to match the door hardware. It’s really amazing how much the home already looks newer with these few changes. 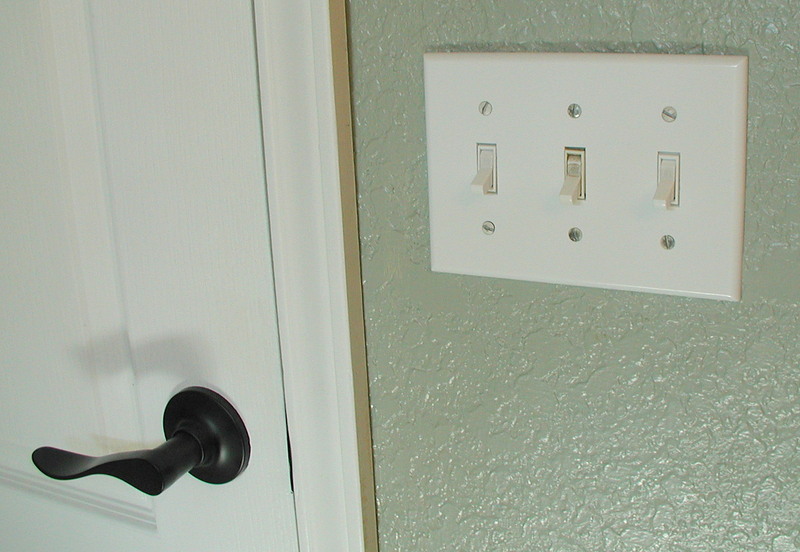 Another change we will be doing is replacing some of the light switches. The switches to the door that leads to the attic were really dirty – probably from carrying boxes in and out of the attic. I didn’t feel they could be scrubbed clean because they deal with electricity (water+electricity) so we just replaced them at 88 cents each. Here you can see the new switches (left and right) next to the old (middle switch) – Quite a difference! This middle switch is going to become a dimmer so hence why it isn’t replaced yet. TIP! Check all the electricity in your house (i.e. switches, outlets, fans, phone, etc…) and make sure they work before putting the house on the market; a good inspection will find these problems and it may put doubt in your buyers’ mind about the quality of the home. For example, we found the downstairs ceiling fan light wasn’t working- in taking it apart turns out the kids must have flung a marble up into the electrical box! Since we don’t use that light I had never noticed. Also, the phone outlet next to the bed needs to be replaced as it is not working either. All these are small changes but it’s going to take a full week to get them wrapped up.